Fulfilling our mission to protect and restore the Morro Bay estuary for people and animals requires a lot of hard work in the field. Today, we’re bringing you our first set of monthly field updates to show you what our staff and volunteers are doing on the ground. April was a busy month for our field staff. Our bioassessment season kicked off on Saturday, April 8th with our annual training. 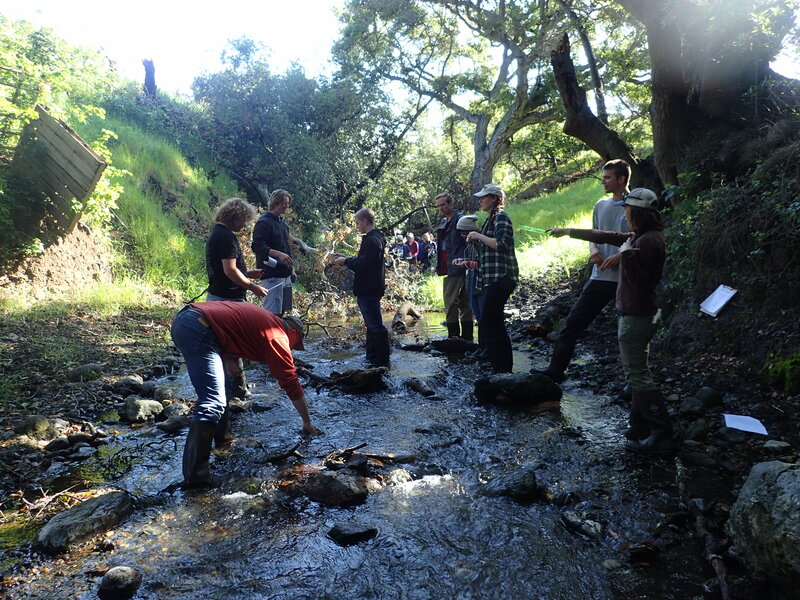 We had 27 volunteers attend this training to learn how to collect macroinvertebrate samples and conduct creek habitat assessments. Field Technician Evan demonstrates how to collect bug samples using our net. Karissa points out riparian features while volunteers practice taking water depth and rock measurements. Each of these surveys take approximately four hours to complete, and we collect a total of 1,200 measurements at each site. Check out this blog post to see what a day of monitoring looks like. This year, we are planning a total of 12 surveys at sites throughout the watershed. This work would not be possible without the help of our amazing volunteers and the generous support of the Harold J. Miossi Charitable Trust. While dozens of volunteers give their time to collect the samples and other data each year, the Trust makes this monitoring and the expensive lab analysis possible. Since 2013, The Miossi Trust has given $40,000 to this effort. 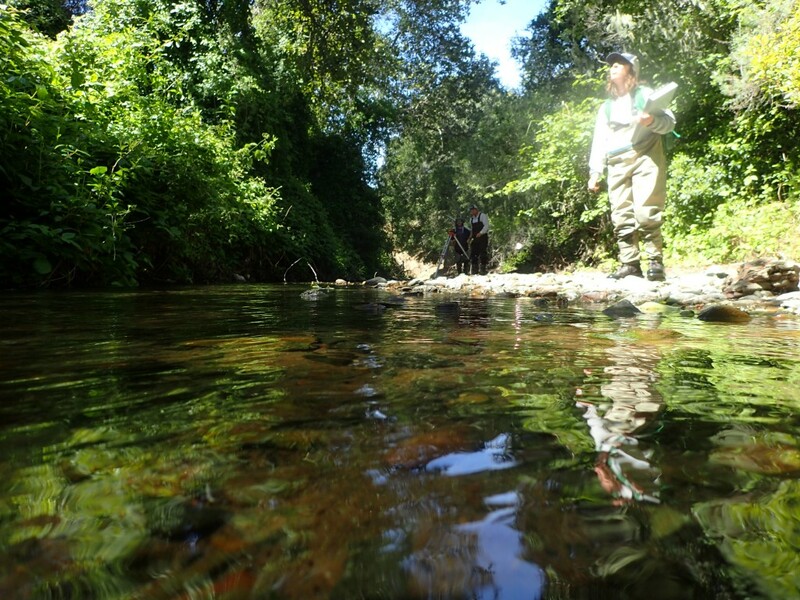 The data helps us understand the health of the creeks and how well they support bugs and fish. In April we completed two surveys. These two surveys were particularly fun because this is the first time these sites have had enough water to do bioassessment surveys since the last big rains several years ago. 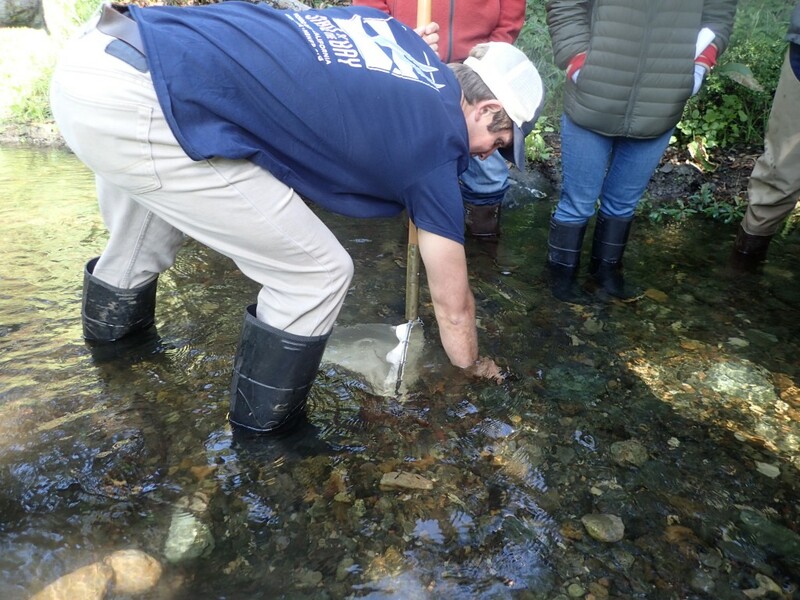 We have been spending a bit of time on Walter’s Creek this year because of our sediment monitoring efforts. Walter’s Creek is also a bioassessment site. 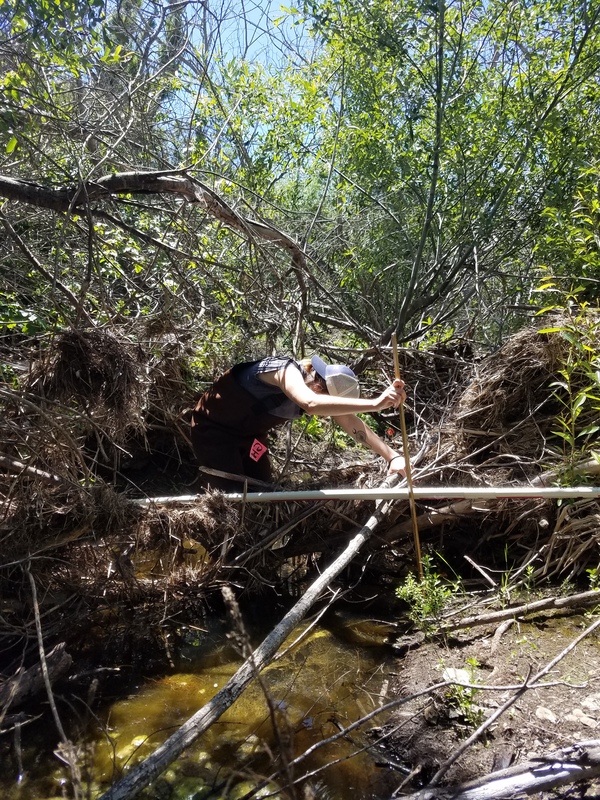 Catie, our Communications and Outreach Intern, came out to help us finish a particularly brushy survey on Walter’s Creek. Here she is measuring water depth, taking substrate size measurements, and checking for algae. 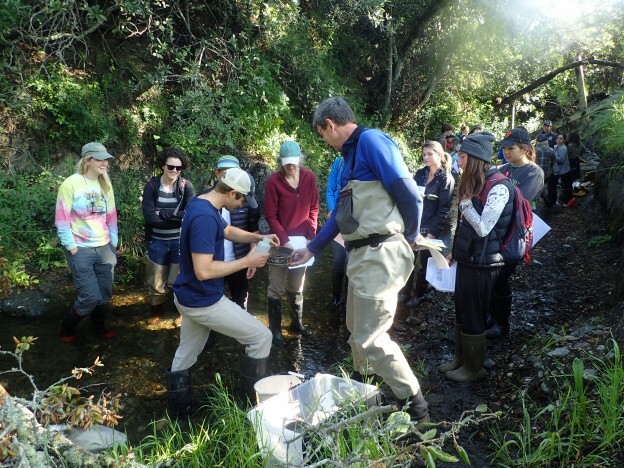 Despite the abundance of poison oak, everyone enjoyed the survey on Los Osos Creek. Like Walter’s Creek, we haven’t been able to survey there for the last several years due to lack of water. Karissa assess the bank vegetation (spoiler alert: it was mostly poison oak!) while Evan shows a volunteer how to measure slope the slope of the creek in the background. We’ll be continuing to monitor throughout May and June, and expect to have data to share by the late summer. Subscribe to get the Estuary Program’s blog delivered to your inbox each week.